Influence Ripples, originally uploaded by David Armano. 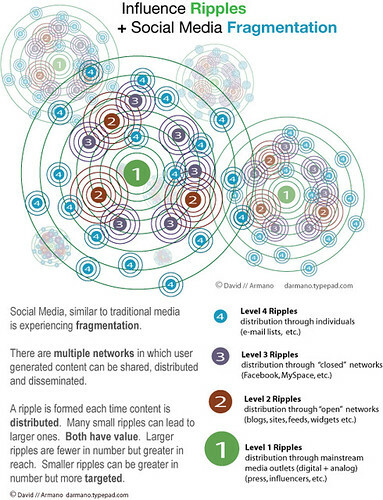 Great visualization of the ripples of distribution and influence in social media. I like it especially because it represents the overlapping and interconnectedness of today's communications. Communications is not one way, and it is definitely not linear. I am going to spend more time studying this image. David Armano is the creator of this image graph. I got the reference for this from Shannon Paul's blog. Today Shannon talks (very smartly) about why blogs matter for communicators. And let's face it, we are ALL communicators. Whether anyone likes it or not, information no longer travels in a straight shot from company to journalist to public. ...More than three quarters of journalists see blogs as helpful in giving them story ideas, story angles, and insight into the tone of an issue, according to a study conducted last year by Brodeur, a unit of of Omnicom Group in conjunction with Marketwire. --Read the entire post. Why is this important for government? It's more important to understand the communications ecosystem than to use the newest tools. Creating a myspace or Facebook page doesn't mean that you are succeeding in communicating. What are you trying to accomplish? How does this tool or technology fit your goals? Are you reaching your audience(s)? And the next important question, are you ready to let your audience reach you? Pulling myself away from the topic of the new administration, turns out there are other things going on in dot-gov. Like college.gov from the Department of Education (Ed). This is a portal to Ed college resources in a slick presentation layer. 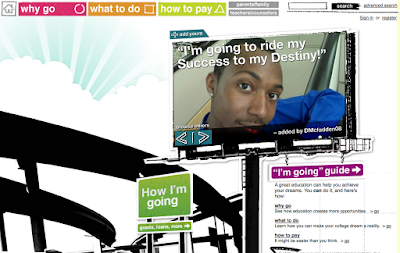 The interactive videos and easy to understand language are signs of a good experience. We are going to use the Free Application for Student Financial Aid on the web as soon as my husband gets back from Sundance. It is great to have the application on the Web. 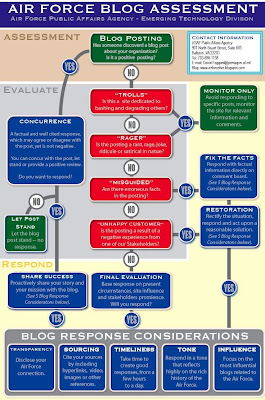 It's this type of web tool--more so than blogs or tweet streams that make online government relevant for citizens. People want money, passports, aid, benefits, and help getting to those resources. So as we work to add the coolest new features to the dot-gov menu, let's not forget to serve the needs and desires of The People. With all the hype about Madoff, I had toyed with the idea of ponzi scheme to pay for college, but will try the online application instead. And I'm glad that it's there. 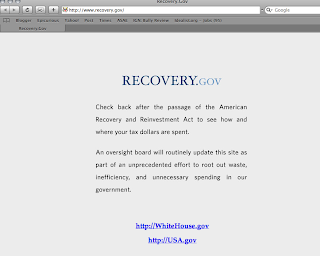 Change came today to whitehouse.gov, and I saw it happen live! It was noon-oh-something, and I was looking at the site when it changed before my very eyes. I didn't refresh my browser. It was pushed new to my existing session. Pretty cool. It's been a very long day, but I did want to acknowledge that in addition to a fabulous day on the mall--no arrests despite 2 million folks crowded on the mall and parade route--change is already happening. Not so good, the new White House site deleted all the old pages so many federal sites--and other sites throughout the Interwebs--now have a bunch of broken links. 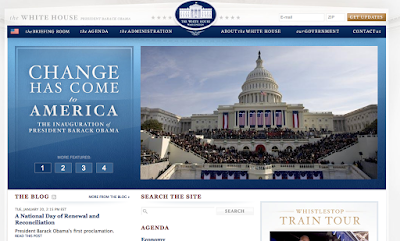 The Good News, the White House site has a blog and other interactive and the promise of interactive features. Setting the bar for other government agencies! See the quick change at www.state.gov, too. In addition to a nice and clean new look, they also archived the old Dipnote. It looks like they will continue to build on this popular destination. To the team at State: Nice work getting a half-dozen or so new blog posts up today! I hope State continues to provide a multimedia hub on the Dipnote site. 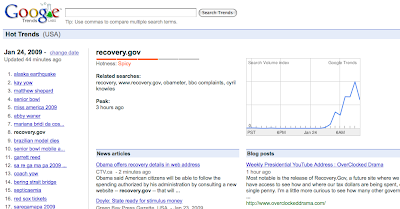 See Gaurav Mishra's most excellent post, The Promise and Myth of Barack Obama’s Government 2.0. In addition to a great set of links and smart analysis, he provides a good structure to think about and talk about "government 2.0." Level 1. Allowing government employees and elected officials at all levels to access and use social media tools like blogs, wikis and social networks to connect with their constituents. Level 2. The strategic use of social media tools like blogs, wikis and social networks by government agencies to achieve their objectives and solicit citizen feedback to improve their processes. Level 3. A participatory platform that engages citizens in policy debates and voluntary service at all levels of the government. Level 4. Open availability of all non-sensitive and non-personal government data so that citizens can use it and third parties can build web 2.0 mashups on top of it. Level 5. Crowd-sourcing the government, party by institutionalizing a process that directly uses the aforementioned participatory platform as an important input into government functions, including policy formation. --Read the entire post. He goes on to give links to examples. Really, read it. You can't manage what you don't measure. Really, you can't. And for folks managing web content and web applications, there is a growing --and many times free--cadre of tools to help you learn about what people are doing on your site, what they are interested in, and what they don't like. Google Analytics, for the price (free) you can't beat it. It does require persistent cookies, so is not right for dotgov without a waiver. StatCounter for smaller sites, includes a nice set of reports for general website reporting. Sitevolume you can track keyword volume on popular social media sites. You can see which words and phrases resonate and compare terms. Look carefully under the hood of these tools to make sure that they meet the regulations for dotgov sites. See "Social Media Case Studies SUPERLIST- 18 Extensive Lists of Organizations Using Social Media." Lists include corporate Twitterers, directory of Fortune 500 blogs, and nominees and award winners in various recognition programs with their case studies. In addition to Robin's fab list, here are some lists from government. The Collaboration Project from the National Academies of Public Administration for a terrific set of case studies of social media/collaboration in federal, state and local goverments. Finally, a (looong) list of government tweeters on Twitter is available at Twitter Fan Wiki. Don't see your agency's efforts on these lists? Speak up and tell them you are missing. These resources are updated regularly. Wonderful lunch today with some of the smartest people working on the web in government. We talked about how critical it is to take risks, the power of great leadership (and what to do when that is less than available) and a bit of the happy dance on the promise of new media/Web 2.0 for improving government (with a small side of concern that we still have a long way to go on "web one-point-oh"). We were talking about innovations on change.gov, the official web site of the Obama-Biden Presidential Transition Team, and tried to read it as if it were the tea-leaves predicting the tools and expectations of the new administration. Like the interactive content "Open For Questions" section where folks can ask questions and other readers can rank the importance of the topics. Me: What do you think was the top question? Smart People at Lunch: Jobs! Definitely the economy. Health care. SP@L: I missed that part of the debate, I guess. Yes, it was true. Take a look. Round one of questions had 978,868 votes on 10,302 questions from 20,468 people (about 48 votes were cast per person). The question reads, "Will you consider legalizing marijuana so that the government can regulate it, tax it, put age limits on it, and create millions of new jobs and create a billion dollar industry right here in the U.S.?" AND, more than a dozen of the top 50 vote-getting questions pertained to amending America’s drug policies. See more on The Hill. I want to be clear that I am not evaluating the value of this question, but I did want to offer the results of this effort as something to consider. Is this the most important issue to the American people? If it is, why didn't anybody know it? If it's not, why does it appear to be the most important? 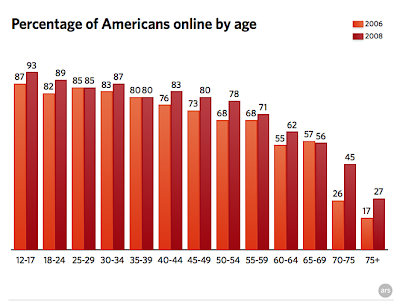 What can we learn from this analysis to help build participation into dot-gov? I recommend to try and fail, try and fail, try and fail, but to never give up on the objective of the political process becoming more rational and less prone to hidden pressure group agendas. And this will include trying and trying and learning and learning until we get it right. In the meantime, we need to figure out what we do with the results. Looks like there will be a few tweets from Chief Paulison to get started (signed -P) followed by a tweet exchange. The promise is to have staff answer any tweets that the Chief can't get to. Every citizen now has the potential to be a collector, an analyst, a reporter, and a publisher -- and so does every government employee. Engaging, trusted personalities employed as brand ambassadors will complement -- not replace -- traditional public affairs and government outreach. Depending on their agency or office's mission and goals, individuals can follow customized strategies to engage specific niches of the public at events, in interviews, and through constant, pervasive use of new and emerging media tools. In an ongoing bi-directional conversation, brand ambassadors employing I3 would work not only on behalf of the government among the people, but also on behalf of the people within the government. Government social ambassadors should be fully accessible, transparent, authentic, and collaborative leaders that inspire people to cooperate for the sake of common concerns. As part of their missions, government brand ambassadors should conduct community-based research to understand the "marketplace." --Read the entire post. Mark's comments fit right in with my lunch conversation. My friend was at a meeting yesterday and had an impromtu a conversation with another attendee from Sunlight. When he asked her, "Do you mind if I blog this," she did take pause. Everyone is a government spokesman because everyone can be a publisher. It doesn't matter if you don't want the game to change, it already has. Might as well embrace it. Trending on the talk about the new CTO--rumours abound that the announcement will be made on Wednesday, here is an excerpt from The Guardian (UK) interview with Vint Cerf, the real father of the Internet. They asked Mr. Cerf, "What do you think the CTO's job will entail?" The first problem is 'what's the job?' - it isn't 100% clear what is desired as an outcome. It's pretty clear just looking at the campaign rhetoric that there's a great apparent desire in the Obama administration to make better use of information technology throughout the government. And so part of the motivation, as I perceive it, is to take steps to improve that. But the choice of the term CTO, I think, was very deliberate - and probably extends to a much broader range of technologies than what you and I might think of as information technology. The indications that I have seen suggest the broader interpretation. ...So what I think is going on here is a great desire to stimulate serious thinking about how to put technology to work - and in the current economic climate there are huge opportunities. Think of all the infrastructure that needs rebuilding across the United States. Clearly we don't want to rebuild it using 20th century technology, we want to use 21st century technology. We get to reinvent a substantial portion of the American physical infrastructure, and I would include in that the telecommunications component – so we're talking broadband. ....What I'm sensing here is that there are many parts of the government interested in green technology or practices – and the CTO, probably, could be a very vocal proponent. --Read the entire interview. Mr. Cerf identifies a big swath of potential responsibility for a White House CTO. He goes on to raise important questions about funding and policy making. The guy has been doing his homework and says nobody has asked him about the job.